The head of state indicated that the political actors that will receive the benefit must commit themselves to “an agreement of peace, a will for peace, a peace process”. May 28 (teleSUR) The president of Venezuela, Nicolás Maduro, reported on Monday that he requested measures of benefit and freedom for the people who participated in the acts of violence registered during 2014, 2015, 2016 and 2017, with the aim of consolidating a peace process in the country. “I have requested measures of benefit and freedom, (for those who) commit themselves in writing, word and action not to return to the conspiracy, the plot, the coup, the guarimba never again,” said the head of state. 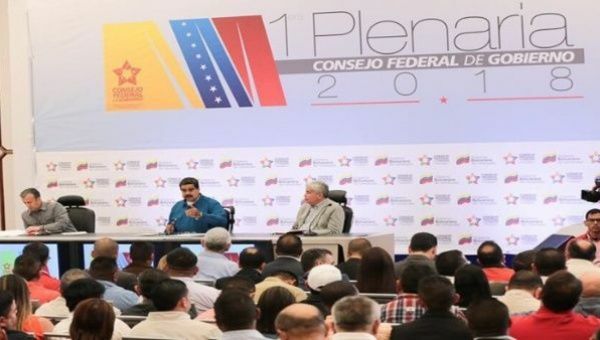 During the first meeting of the Federal Council of Government in Caracas, with the governors and mayors of the South American nation, Maduro reiterated a call for peace and a “great peace dialogue” between the different political actors, saying that in the next days there will be new announcements.